I'm obsessed with the French. I like the way they dress, the way they speak and the way they eat. I am a firm believer in the whole French girls don't get fat or whatever it takes to make me believe that French food will not make me a million pounds. Rendez-vous is the reason for this belief system. I want to eat there as often as possible. They just moved to a new location in the last year from Downtown Deland. They are open for lunch and dinner and have amazing French wines. 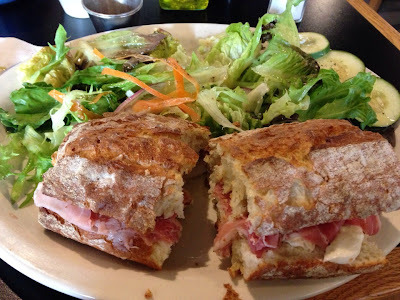 It is hard to tell you what I like the most, but I love the Moules Frites and this Prosciutto and Mozzarella Sandwich is my absolute favorite. The side salad with the mustard vinaigrette is addicting The freshly baked French bread is good enough for you to throw that whole no carbs right out the window. It has wireless, so it is also a really good sneak away to get some writing in mid-day with a nice glass of wine. (Don't judge) Also, if you have a chance, get a Nutella and strawberry crepe for desert. Its is incroyable (which amazing for those of you who didn't have the most amazing high school French experience that I do! !